On Tuesday I experienced the one event that al brewers fear – the empty keg. Somehow, I have three beers in-progress, but not one ready for drinking. So its time for an emergency brew session. Today’s beer is a somewhat special brew for me – for the first time I grew my own hops over the summer, and have a few ounces of Goldings that need to make their way into beer. Because the goal of this brew is to highlight these hops, the beer itself is simple – it would be a Marris Otter/Golding SMaSH, if not for the addition of the invert sugar I accidentally made while trying to make my own Belgian Candi Sugar. I purchased some East Kent Goldings for bittering, as I do not know the alpha acid content of my home-grown hops. ARTHUR: The Lady of the Lake, her arm clad in the purest shimmering samite, held aloft Excalibur from the bosom of the water signifying by Divine Providence that I, Arthur, was to carry Excalibur. 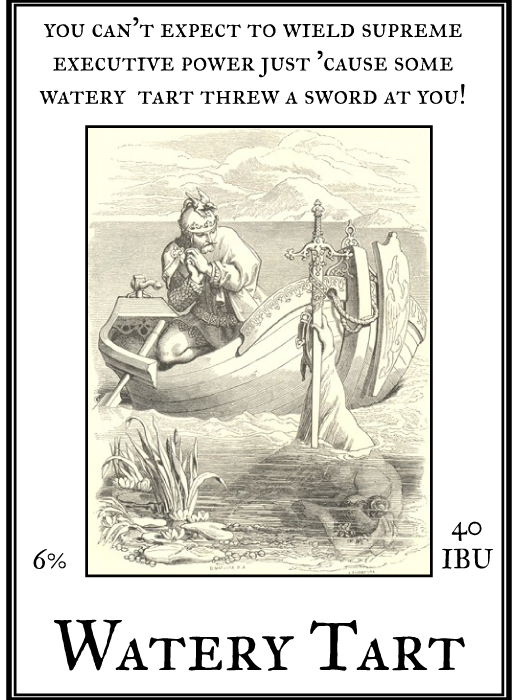 DENNIS: Well, but you can’t expect to wield supreme executive power just ’cause some watery tart threw a sword at you! 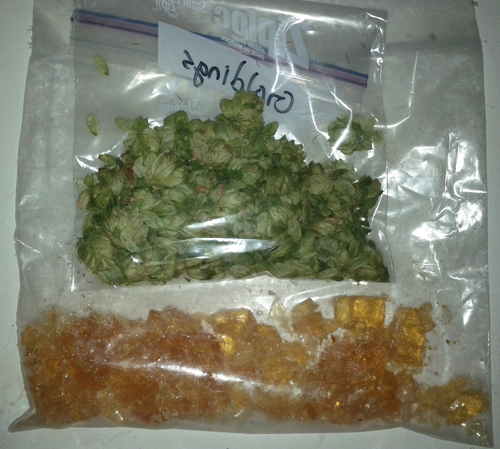 Home-grown hops & home made invert sugar. Mash-in was perfect, hitting the temp dead-on. The mash went on slightly longer than planned, as I had to go in the house for my birthday breakfast (lemon-cranberry pancakes & maple-smoked bacon) – where I got to unwrap my new barley crusher. Yes, my wife is that awesome! Despite the extended mash and the near-freezing temperatures in my garage, the mash lost less than 1C. I added the first 6L of mash water near-boiling to do a mini-mash out, drained the tun, and the performed a second batch-sparge using ~12L of water at 75C. In complete contrast to my last few brews, my pre-boil gravity was higher than expected – 1.045 instead of 1.041. While I’m not one to look a gift-horse in the mouth, hopefully I’ll be able to get a bit more consistency with my new mill. The boil went as expected – no boil over, sugar added 20 minutes before the end of the boil (I fractured it with a hammer before the addition), irish moss added at 15 minutes, and home-grown hops (~10 g Goldings) added 5 minutes before flame-out. Brew ended up with an OG of 1.065, more than 10 points over what I expected!